Is amhránaí agus cumadóir amhrán Afra-Mheirceánach í Tracy Chapman (rugadh 30 Márta 1964) a bhfuil clú agus cáil bainte amach aici mar gheall ar na hamhráin ‘Fast Car’, ‘Talkin’ Bout a Revolution’ agus ‘Give Me One Reason’. Thosaigh Chapman ag seinnt an ghiotáir agus ag cumadh amhrán agus í ina páiste. Bronnadh scoláireacht uirthi, tríd A Better Chance, a thug deis di freastal ar Wooster School i gConnecticut agus ansin glacadh léi in Ollscoil Tufts, Bostún. 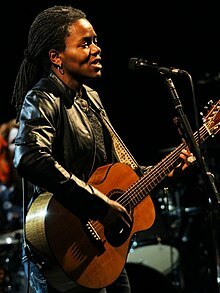 Is i gCambridge a thosaigh Chapman ag seinm ar na sráideanna agus i gcaifí agus tar éis di céim a bhaint amach ón gcoláiste, shínigh sí conradh le SBK agus d’eisigh sí Tracy Chapman (1988). Scríobhadh léirmheasanna lúcháireacha faoin albam agus chuaigh sí ar an mbóthar agus ag bailiú lucht leanúna. I ndiaidh di seinnt ag 70ú breithlá Nelson Mandela, thosaigh 'Fast Car' ag ardú sna cairteanna sna Stáit Aontaithe. Bhí an-díol ar an albam agus ar an singil agus d’éirigh leis an albam ceithre Grammy a bhaint amach. Níor éirigh chomh maith céanna leis an gcéad albam eile, Crossroads (1989). I 1992, agus albam nua, Matters of the Heart, bhí Chapman ag seinnt os comhair lucht leanúna beag agus dílis. Baineadh geit as lucht leanúna an cheoil nuair a d’eisigh Chapman albam eile, New Beginnings (1995) agus an singil ‘Give Me One Reason’, a bhuaigh Grammy i 1996 don amhrán raic ab fhearr. I 2000 eisíodh Telling Stories. Craoladh an singil 'Telling Stories' go minic ar staisiúin raidió na hEorpa. Chuaigh Chapman ar chamchuairt timpeall na hEorpa agus na Stát Aontaithe i 2003. I Meán Fómhair 2005 eisíodh an seachtú halbam uaidh, Where You Live. Tugadh an leathanach seo cothrom le dáta an 5 Bealtaine 2018 ag 03:52.